Join us on Thursday, Oct. 29 for a special benefit preview of George Takei’s new Broadway musical, Allegiance at the Longacre Theatre in New York City! Allegiance is a multi-generational tale about family, freedom, love, and loss as Japanese Americans were incarcerated in camps during World War II. It is inspired by the true-life experience of its star, George Takei, the recipient of AALDEF’s 1992 Justice in Action Award and a beloved actor (Star Trek), social justice activist, and social media icon. The musical also features Tony Award winner Lea Salonga (Miss Saigon, Les Miserables) and Telly Leung (Rent, Glee). 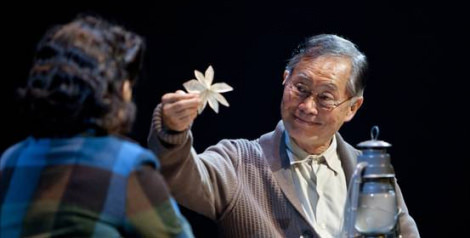 Allegiance had its premiere in 2012 at the Old Globe Theatre in San Diego and is one of the few Broadway shows to have an Asian American cast, composer/lyricist, and director. AALDEF has a limited number of orchestra and front mezzanine seats at a specially discounted price of $125 per ticket (box office price $142). Rear mezzanine and balcony tickets can also be purchased for $75 and $65. Buy your tickets today by calling 212.966.5932 x212 or emailing events@aaldef.org. Maximum 4 tickets per person. Reservations are final only after payment has been received, and we cannot provide ticket refunds or exchanges. Be part of AALDEF’s theater party for one of the big Asian American events of the season! Special thanks to Nielsen, the premiere sponsor for our event.